There's a new ad campaign that tells kids Barbie dolls aren't just for girls anymore. CHICAGO (WLS) -- There's a new ad campaign that tells kids Barbie dolls aren't just for girls anymore. The TV commercial shows a young boy with two girls. They're excited about the new Moschino Barbie. Two collector's edition dolls were created as part of Mattel's partnership with the Italian fashion house. 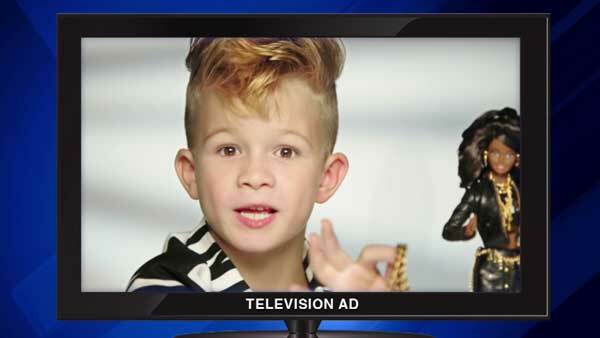 In the ad, the boy describes Moschino Barbie's stylings as "so fierce!" His outfit and the way his hair is styled could be a reference to Moschino designer Jeremy Scott. Scott told PeopleStyle that Barbie inspired him to become a designer and said she is the "ultimate muse." The International Business Times reports the dolls sold out within an hour last week. Mattel hopes the ad tells children that they can all love Barbie.